The community dig took place as a series of stages, from early investigations to see what might be present on the site through to full scale excavation. Each stage was carefully planned so that not only were people were able to understand the descision making process, but that each stage had specific objectives, a set of targets and questions to be answered by the archaeological work. The Middlewich Community Dig has been a five-stage programme with a series of clearly defined aims and objectives. The foremost aim was to enable all interested members of the community to take part in an open event which guided them through the full process of carrying out an archaeological excavation. This was to include site prospection, survey and excavation techniques, and the recording and interpretation of site data. The target of the dig was Buckley’s Field, identified as an area of undisturbed ground within the Roman core of Middlewich. In order to evaluate the nature and extent of the archaeological remains, geophysical survey (magnetometry and resistivity) and trial trenching were employed, the results of which were then be used to plan a campaign of excavation undertaken by volunteers with professional archaeological supervision. Prehistoric origins: can we find evidence for pre-Roman occupation/salt making? 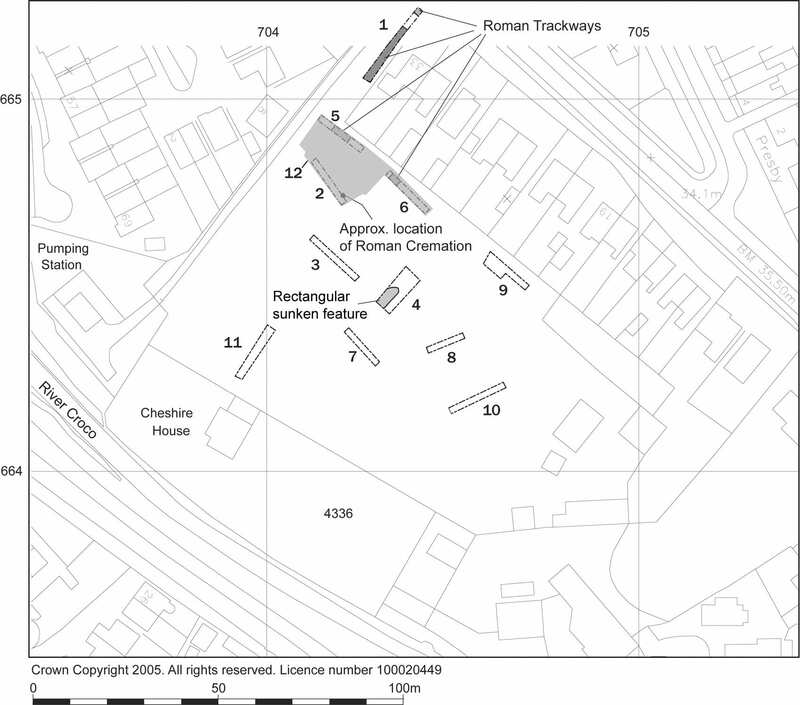 Location of Bestwick excavation: how this can add to our knowledge of previous results? Before the excavation started a series of lectures and evening classes were held for those who had expressed an interest in participating. 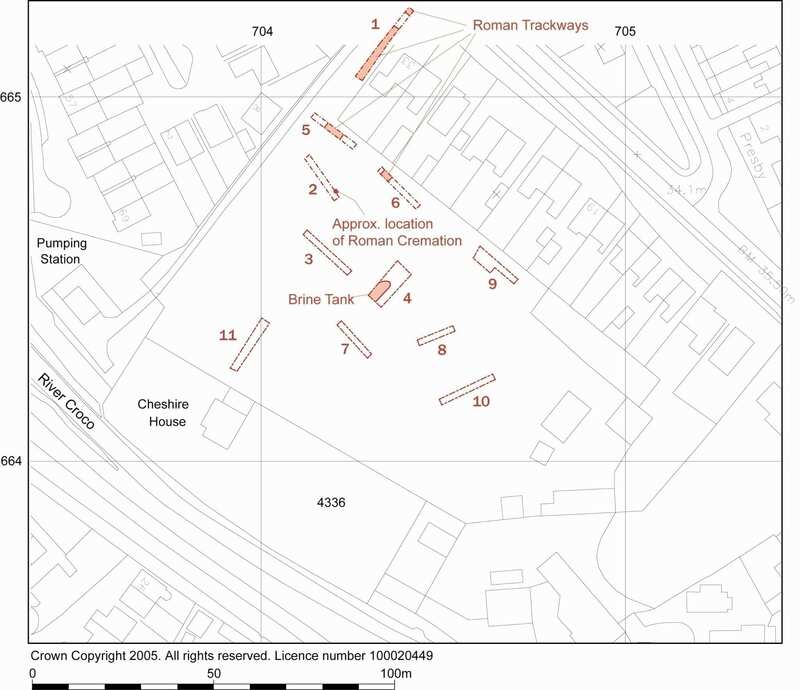 The lectures were planned so that the volunteers could learn about the general context of Roman Britain and about the specific context of Roman Middlewich. Some of the basic principles of archaeological methods were also taught. The lecture topics included the structure of British archaeology, archaeological approaches, late Roman Britain, Saxon & Norman Middlewich, the structure of Roman society and social organization within Roman Middlewich, principles and practice of archaeological recording, artefact studies, palaeoenvironmental studies and dating techniques. The magnetometry and resistivity surveys were carried out by Stratascan in June and July 2005. A detailed methodology for this is outlined in the 'Geophysical Survey' section below. Following the completion of the geophysical survey a series of eleven evaluation trenches were excavated across the site. Initially four trenches were opened targeting linear features which had been identified by the magnetometer survey (Trenches 2, 3, 8 and 10). A further trench (number 11) was excavated on the slope along the south-western edge of the site to assess the original topography of the ground and the processes which may have formed it. These trenches were opened by mechanical excavator fitted with a toothless ditching bucket on the 14th July 2005 under full archaeological supervision. The modern topsoil and subsoil were removed until either archaeologically significant deposits or natural geology was encountered. In Trenches 2 and 3 a portion of the subsoil was left intact in order to investigate it more thoroughly by hand excavation. A second phase of trenching was planned to coincide with the results of the resistivity survey which took place on the 20th July 2005. However, as the results of the survey were inconclusive, it was decided to target additional features seen during the magnetometry survey towards the centre of the site (Trenches 4 and 7), and to position the rest of the trenches (5, 6 and 9) along the north eastern edge of the site, where it was anticipated that linear features running westward from King Street would be located. These trenches were also opened by machine under supervision, and in all cases machining was stopped when archaeologically sensitive material was encountered. Trenches 4 and 7 were then excavated and recorded stratigraphically by hand. A final trench was excavated adjacent to the access track leading down to Buckleys Field from King Street (Trench 1). Trenches 1, 5, 6 and 9 were cleaned, photographed and planned, but were not excavated as these were retained for investigation during the main excavation. The location of the evaluation trenches is indicated in Figure 5. The deposits uncovered in Trench 1 during the evaluation were excavated stratigraphically by hand as a running section through the southern half of the exposed features (including a track, road, ditches and floors). The restricted space in this location meant that it was not possible to widen the trench beyond 2m. It was anticipated that through a programme of sieving and metal detection of spoil it would be possible to increase the likelihood of dating the deposits and therefore phasing the sequence. Trench 4 was extended to the southwest and northwest in order to expose the full extent of a rectangular feature seen during the evaluation. Although initially it was hoped that a section could be excavated across one end of the feature, waterlogging prevented this and so a series of small sondages were excavated at points across the feature to determine its depth and make-up. Again, all spoil was sieved and scanned for metal objects to maximise artefact retrieval. The features in Trench 9 were excavated stratigraphically by hand in order to determine their function and date. An open area trench (Trench 12) was excavated in the northern corner of the site, roughly rectangular in plan running from the north-eastern corner of Trench 5 to the south-western corner of Trench 2 (that is approximately 15m x 18m). In addition the trench was extended from its south-eastern edge to connect with Trench 6. This trench partly overlay the position of John Bestwick’s 1970’s excavation of Site J. The modern topsoil was stripped from the whole area by machine under full archaeological supervision, and then subsequent mechanical excavation through the underlying subsoil was stepped in 0.2m deep spits, each a bucket-width wide, starting from the highest point along the north-western edge of the trench and diminishing in height towards the southeast. A site grid tied into the Ordnance Survey National Grid was established using a total station and Penmap surveying software. On this basis the trench was subdivided into 1m squares and a sample of these (ten in total) were hand excavated as test-pits through the homogenous subsoil, retrieving artefacts through sieving and metal detection in 100mm spits. It was hoped that this may help to determine whether there was any stratification within this soil. The depths recorded by the test pits were used as a guide during the removal of the remainder of the subsoil overburden by machine to expose the underlying archaeological remains. All undisturbed archaeological deposits were excavated stratigraphically by hand and recorded using a single context recording system, with levelled plans and sections drawn at scales of 1:20 and 1:10 respectively, a photographic record and index, and context records. All spoil generated from machining and hand excavation of the trenches was scanned with metal detectors and manually sieved for finds. In addition exposed features and trench surfaces were routinely scanned with metal detectors, and the location of any coherent signals labelled for reference during manual excavation. Finds were retained and stored by context, unless obtained from spoil in which case they were labelled as unstratified. All finds were processed on site, including washing, drying, weighing and the creation of a bulk finds record with material separated into its individual categories. All delicate artefacts were stored in suitable conditions, off site where necessary. Samples were taken from sealed contexts that were waterlogged or had the potential to provide evidence of the conditions under which they were formed. These were stored in 10 litre buckets under suitable conditions and supported with an index and individual sample record sheets. The sampling strategy was kept under constant review, in consultation with English Heritage’s Regional Science Advisor. The initial processing of the bulk samples and artefacts was undertaken on-site by the community volunteers. The post-excavation programme has been the subject of an additional community programme funded by the Heritage Lottery Fund. This report represents the culmination of that process; the aims, objectives and tasks which have informed it are detailed in the Post-excavation Assessment Report. All post-excavation work has been carried out to MAP2 specification (The Management of Archaeological Projects guidelines set by English Heritage in 1991 are available to view online at http://www.eng-h.gov.uk/guidance/map2/index.htm).